An Elk Grove man was taken into custody on several charges after being contacted by police on a service call. 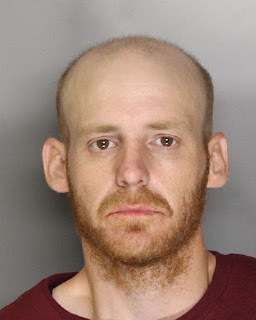 On the morning of Monday, May 22 Elk Grove Police officers contacted Conner Peckham, 29, on the 2300 block of Laguna Boulevard. Upon contact, Peckham (pictured above) allegedly provided officers with false information about his identity. Officers were able to determine the suspect's name and a records check revealed he had an active felony arrest warrant and was on probation. A search of Peckham reportedly led to the discovery of counterfeit money, reported stolen checks, and narcotics. Peckham was arrested and booked into the county jail where he is being held on six misdemeanor and three felony charges including violation of probation. The suspect is not eligible for release and arraignment is scheduled for Wednesday, May 24.